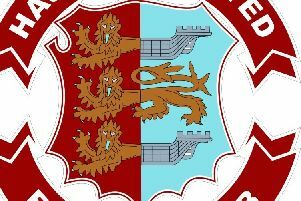 After successive postponements over the past week, Hastings United’s footballers will finally return to action tonight (Tuesday). The U’s will resume their quest to home in on the Ryman Football League Division One South play-off spots by entertaining Corinthian-Casuals. Kick-off at The Pilot Field is 7.45pm. The two teams were due to meet in the reverse fixture on Saturday, but that match succumbed to a waterlogged pitch so tonight will be the first time they’ve locked horns this season. United are seventh in the table - five points and two places outside the play-offs but with between two and six games in hand on every other club in the division. The U’s are top of the division’s form table having won five of their last six encounters and another victory tonight would lift them above sixth-placed Faversham Town. But it certainly won’t be easy. Casuals are only three points and five places behind United having played just two more matches, and enjoyed a splendid FA Trophy run earlier in the season. Four of United’s last five Tuesday night matches have been postponed (all of them away from home), including last week’s game against East Grinstead Town, which has been rearranged for Tuesday March 1.